In treating Japanese culture like superficial embellishments, Japanese people like unknowable others, and Japan itself like an endearingly quirky playground for yet another white American narrative, Isle of Dogs' messaging about protecting the vulnerable falls flat. Wes Anderson's Isle of Dogs has something to say about the ugly allure of xenophobia, the sin of standing by while atrocities are committed, and the importance of protecting the most vulnerable members of society. The film asks us to feel for the helpless, here in the form of guileless dogs, and consider how easily fear can be weaponized against them. These are all fine and noble ideas, and ones that feel especially urgent in this scared, suspicious world. It's too bad then, that Isle of Dogs can't help getting in its own way. Even as it pleads with us to think of the pups, the movie struggles to portray its actual human characters as, well, human, and the result is that undermines its own messaging about empathy and cross-cultural understanding. Isle of Dogs takes place in a near-future dystopian Japan, where the fictional city of Megasaki has just passed an ordinance exiling all dogs to Trash Island – ostensibly to stop the spread of disease, but really just because Mayor Kobayashi has it in for the entire species. But this isn't a movie about the people of Megasaki. 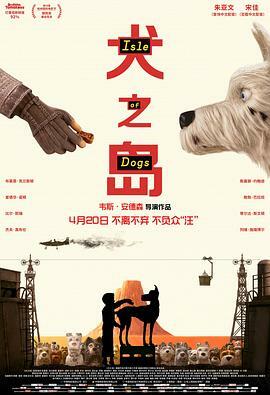 The film focuses on the dogs, who are voiced by a bang-up cast of mostly American stars: Bryan Cranston, Scarlett Johansson, Edward Norton, Bill Murray, Jeff Goldblum, and the like. A card explains early on that all of their barks have been translated into English. The humans, meanwhile, largely speak in their native Japanese. Occasionally their dialogue is subtitled, or repeated in English by an interpreter voiced by Frances McDormand, but the bulk of it is left untranslated. The effect these choices have on our sympathies is strong and immediate. The canine characters are instantly more relatable and accessible to the (presumed English-speaking) audience, while the human characters are literally incomprehensible unless you speak Japanese. In a movie where the leads are largely inhuman, it's the humans who end up feeling like the inscrutable foreigners. This is deliberate, of course. Anderson wants us to see this situation from the perspective of the dogs, and not the humans, and language is a powerful way to steer us toward a side. The problem is that Isle of Dogs falls into a long history of American art othering or dehumanizing Asians, borrowing their “exotic” cultures and settings while disregarding the people who created those cultures and live in those settings. In Anderson's case, the borrowing is done artfully and meticulously. Anderson being who he is, every aesthetic detail is carefully considered. Not a grain of rice is out of place, not a taiko drumbeat is out of sync, not a kimono sash ripples without his say-so. There are affectionate references to Japanese cinema greats (this is a great rundown of all the Akira Kurosawa nods crammed into its 101 minutes), and homages to other Japanese arts like haiku and kabuki. But none of it really means anything in Isle of Dogs. All of these stylistic flourishes are just that – flourishes, and nothing more. If there's some reason Isle of Dogs had to be set in Japan, if there's something specifically Japanese about the story Anderson is trying to tell or the message it's trying to send, I don't know what it is. Contrast that to last year's Coco, for example, which centered around a particular Mexican tradition. Indeed, Isle of Dogs seems to go out of its way to remove its Japanese trappings from their real-world context. The film embraces a 1960s aesthetic, but since it's set in the 2030s, it's free to make up its own history without worrying about whatever was actually going on in post-war Japan. This awkwardness is exacerbated when Isle of Dogs introduces its first and only major American character about midway through the movie. Up until this point, the sole human hero has been Atari (Koyu Rankin), a 12-year-old boy who sets out to Trash Island in search of his guard dog. Tracy, voiced by Greta Gerwig, is a young American exchange student who's enraged by the doggie quarantine and moved by Atari's story, and sets out to do something about it. Tracy is a classic example of the "white savior" archetype – the well-meaning white hero who arrives in a foreign land and saves its people from themselves. In this case, she's the scrappy girl who refuses to take the mayor's proclamation at face value, digging for answers and eventually leading a rebellion against the corrupt powers that be. It's a portrayal that is as flattering to Tracy as it is unflattering to the Japanese: Apparently, this is an entire people so meek and compliant, they'd give up their beloved pets with barely a word of protest. What's more, unlike the Japanese characters, Tracy is literally easy to understand, since she's the only sympathetic human character who speaks largely in English. Up until Tracy appears, Atari is the closest thing Isle of Dogs has to a relatable human character. He may be stuck speaking a language that neither the dogs nor the human audience can understand, but his actions are sympathetic. When Tracy appears, however, she becomes the audience-identification character, which relegates Atari to the role of other – we start to see him from her perspective instead of his own. He becomes a symbol; Tracy becomes the proactive hero. Well, Tracy and the dogs. There could have been something subversive about casting a bunch of wealthy white men as a victimized refugee population, turning the tables on a class that typically enjoys the highest level of privilege. (See: Thor: Ragnarok, which pulled off a similar reversal just a few months ago.) But Isle of Dogs lacks the self-reflection required to make it work. We are not invited to see ourselves in the human population giving in to fear and confusion, despite the obvious parallels to our own current situation. We're only invited to see ourselves in the poor downtrodden dogs and their heroic human friends, who are under attack by a group of cryptic foreigners. The film insists on the humanity of its dogs at the cost of the humanity of its humans. That's a real missed opportunity for Isle of Dogs, which does work beautifully on a number of other levels. I may have my qualms about Anderson's use of Japanese culture, but I can't deny he makes it all look great – every frame of this is pretty, in that perfectly precise Wes Anderson way. The voice cast is excellent, particularly Cranston as a gruff stray and Tilda Swinton as a prophetic pug ("She can understand the TV," another dog marvels). And the central saga of the boy and his animal companion ought to bring a tear to the eye of anyone who's ever loved a pet. But in treating Japanese culture like superficial embellishments, Japanese people like unknowable others, and Japan itself like an endearingly quirky playground for yet another white American narrative, Isle of Dogs' messaging about protecting the vulnerable falls flat. The movie digs up all the usual questions about who gets to tell which stories and how, about the difference between appreciation and appropriation, about the responsibilities that storytellers have to the cultures they're borrowing from. But present them to Isle of Dogs, and it can only respond with a cocked head and a blank stare that says, "Who, me?"